Google Hummingbird Infographic - What Next for Google Zoo? 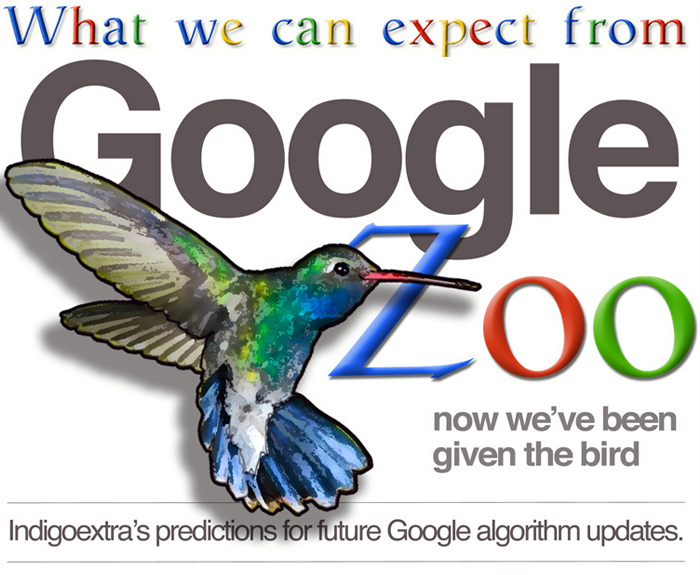 What we can expect from Google Zoo now we've been given the bird. (A text version of the infographic is shown below). Our tongue-in-cheek predictions for future Google updates after Hummingbird. Google will use thousands of human reviews to create algorithms that can identify beautiful and original graphic design. With Peacock, human feedback on design will also become an increasing factor in rankings. Pig - Too much stuffing? Sites will be further penalized for keyword stuffing in anchor texts and on-page SEO. After Pig lower keyword volumes for body content will be more desirable. Google have previously focused more on bad incoming links. With Piranha, they will penalize sites with auto-generated outgoing links or links to spam or virus sites. Previous algorithm updates have focused more on penalties than rewards because Google assumes for each bad link it finds, there are more. As Google improves its ability to detect bad links, after Porcupine, a few bad incoming links will be simply ignored, rather than causing penalties and good links will give extra benefit. Google and Apple join forces to create the new GooiMac a liquid computer you drink that secretes itself into your brain, giving you instant advert free access to the net while awake, and a fiesta of subliminal adverts in your dreams each night. Google are updating their PageRank toolbar less and less frequently. After Poodle update, Google will remove it completely and instead show the Poodle banner for prize winning sites that have been perfectly groomed to meet Google's bar of excellence. No animals were hurt in the creation of the hummingbird infographic. Infographic created by www.indigoextra.com. Google and Apple are in no way responsible for, nor do they endorse or support anything on this page.